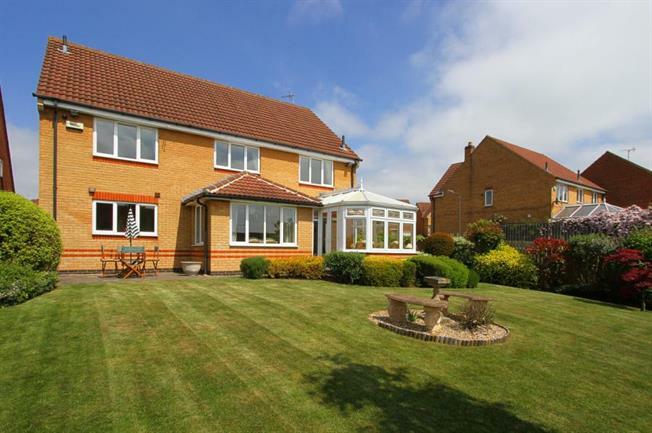 5 Bedroom Detached House For Sale in Chesterfield for Offers in the region of £450,000. A viewing is highly recommended to appreciate this stunning executive style five bedroom detached house on a large corner plot with southerly facing rear garden. This property is flooded with light from the moment you enter. The property offers ample living space with separate dining room and large kitchen/diner, family room, complete with a conservatory, that's FOUR separate reception rooms! The property offers modern open plan living with large double doors meaning you can open the house up and enjoy the light and space it brings. With separate utility room and downstairs cloakroom this property is the perfect family home! Upstairs we have the large master bedroom complete with built in wardrobes and en-suite shower room. The following four bedrooms are all double bedrooms complete with built in fitted wardrobes and a family bathroom. An integral double garage is the car fanatics dream. In addition, the large driveway offers parking space for a further two vehicles. A nice and secure southerly facing garden which is not overlooked and allows for the sun all day long! This property is a must view to really appreciate its finish and quality. Call Blundells NOW to arrange your viewing. Barlborough a sought after village location with an array of local amenities nearby and excellent access to the motorway network at the nearby Junction 30 of the M1, Sheffield city centre, Worksop and Chesterfield. Barlborough village centre provides a host of local pubs and the village church.